"MID" both switch & wireless operated. Hides 1 number plate only. 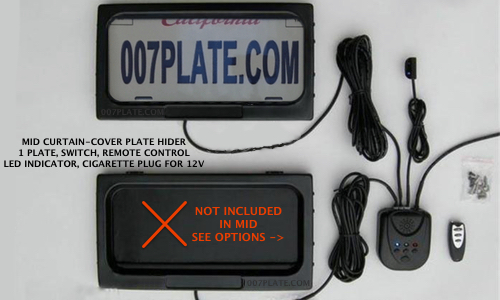 Comes with an LED indicator light to remind you when your plate is hidden. Also includes a cigarette lighter plug for easy power supply (can be hard wired to battery too). "MID" curtain-cover gadget comes with 1 hide plate bracket so you can ONLY hide 1 license plate. It is up to you if you hide only front or only rear number plate. Has a central brain unit which installs inside your vehicle. Central brain unit has buttons on it which can operate 2 gadgets (useful if you upgrade to "PRO" kit later). 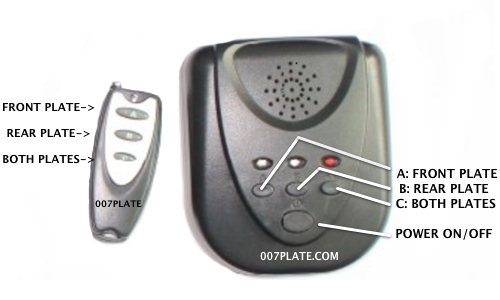 It also comes with a tiny keychain remote control so you can operate the gadget from up to 150ft away. Comes with an LED light which lights up anytime your plate is in HIDE position, very useful so you don't forget that your plate is hidden. And comes with a cigarette lighter plug for easy 12v power, can easily be hard wired to battery too. Underneath 2 closing screws only allows for vehicles with under reach frame closing. Modification needed for example, JK tag position . OEM bumper unables to use traditional closing method. I really like the remote controlled feature, my friends flipped (lol) when I showed them. Can't say anything bad about this product, so far I haven't had any problems. It works as advertized. Awesome! Thinking about getting one for my motorcycle now. Any discount on the second purchase? A: Yes please email us at help@trydeal.com for a mutli-time discount code.